Beginners and advanced students alike can ‘spread their wings’ with Lynne Ann’s proven teaching style and over 25 years of experience while learning to make this butterfly wing cane in polymer clay. Students will learn to blend custom colors and transform them into a base cane that will be turned into the wings of a butterfly. While the cane looks quite complex, Lynne Ann has broken the process down into a series of easy steps shown in a packet with over 100 step by step color photos. The magic happens when Lynne Ann shows students how to transform the wing cane into all kinds of beautiful pieces, like a mermaid’s tail, complex flower petals and other recombinant canes. The simplicity of leaves and petals and classic beauty of turn of the century style filigree come together in this beautiful piece that can be worn as either a pendant or a pin. 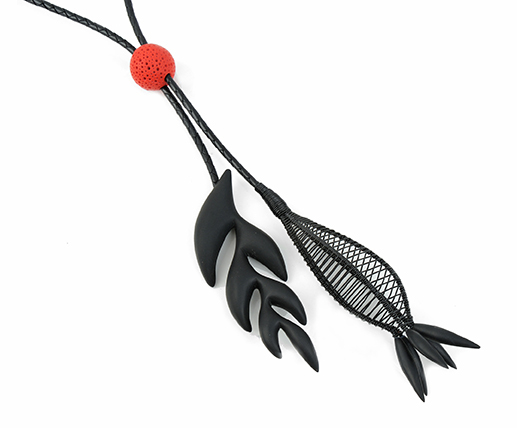 Students will learn to create a subtle gradient blend with polymer clay, turn it into two different canes (one leaf, one petal), then build a pendant using neo-classic filigree pieces from Kabela Design and finish the piece off with a Swarovski Rivoli crystal and a finding that combines a bail and a pinback, making it wearable either way. 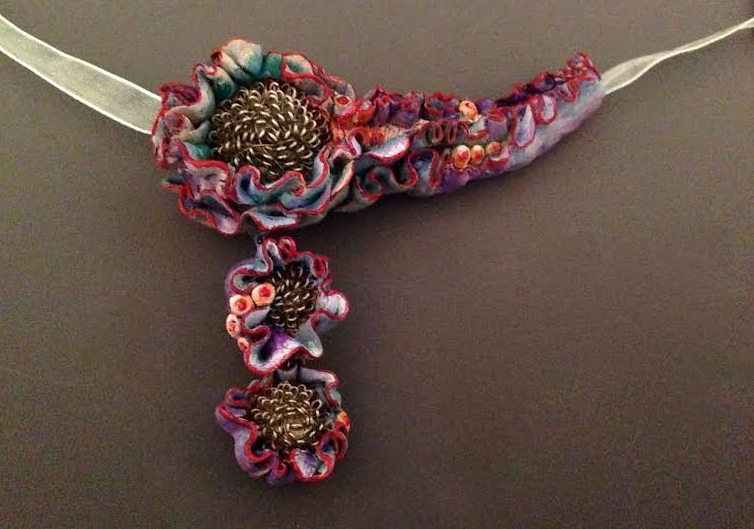 Lynne Ann will cover cane design and construction, even slicing, the best way to create a metal and clay fusion piece using special adhesive material, finishing without sanding (as it is nearly impossible to sand a dimensional piece), and metal to clay and crystal to clay fusion. Learn to use polymer clay canes to create gorgeous, realistic or Avatar-like supernatural pods and buds! We’ll make a beautifully shaded petal cane, create these awesome little buds that work great as beads, earrings, pendants and more. Learn to form, reduce and manipulate the petal cane, construct a realistic looking pod and add sculptural elements like twisted calyx points. Learn to antique and shade the pods for more realism and finally, the best way to finish the piece without all the tedious sanding! Please note: This picture demonstrates an assortment of pods, but students will be making just one petal cane and a couple of pods due to time constraints. However, each student will make enough cane to swap pieces with the others so that they can make several other pods with the techniques they’ve learned. GRAPHIC PATTERNS EXTRAORDINAIRE – AND IN COLOR TOO! Artist, author, and designer, Jana Lehmann, will be joining us at Master Class Camp for the first time in July. 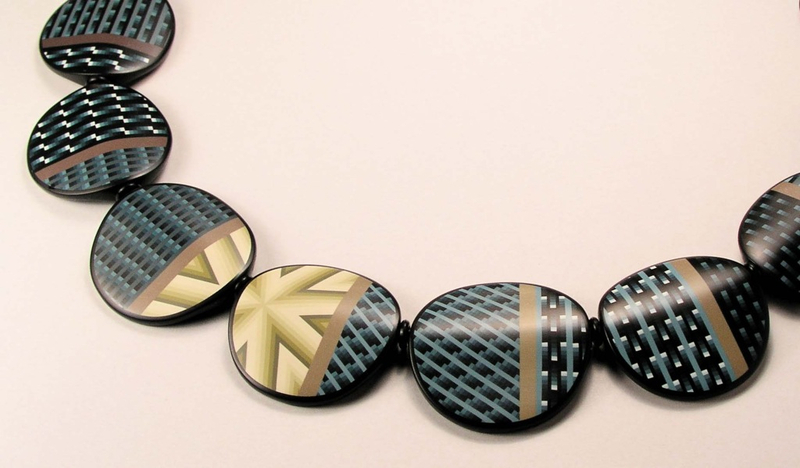 I have been drooling over her work which used these graphic patterns in the most unusual ways. Imagine this patchwork of graphic tiles in bright color blends! WOW! Check out her Flickr site for more eye candy. We want to make this a great experience for Jana and all instructors teaching, so if you haven’t registered yet, wait no longer. Workshop information is available HERE and online registration is available HERE. Don’t hesitate to ask questions if you have them. See you in 1 1/2 months!